Yep, third battle of Gettysburg. There would be another after this. The camapign map shows that the Confederacy is doing better than the historical model. The west is almost cleared and in the east Maryland and much of Pennsylvania is occupied under the Stars and Bars. Indeed Rebel armies are attacking to the north of Washington. 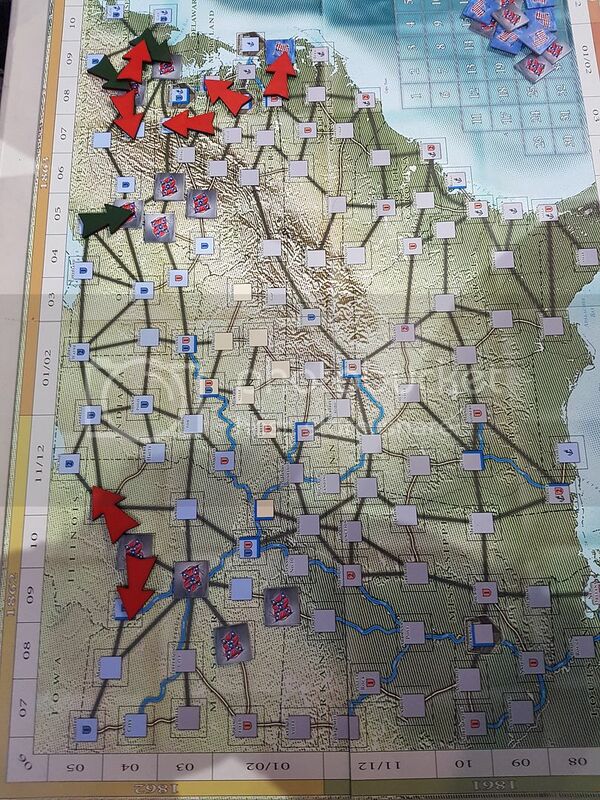 The Rebels would be making 7 attacks in this the opening of 1863, the Union only 3. I was sent to Gettysburg to defend against Dave. Please note all those Union guns in the top left. 7 to my 2 with another 2 Union guns on the right. Sitting back didn't really look an option to me. 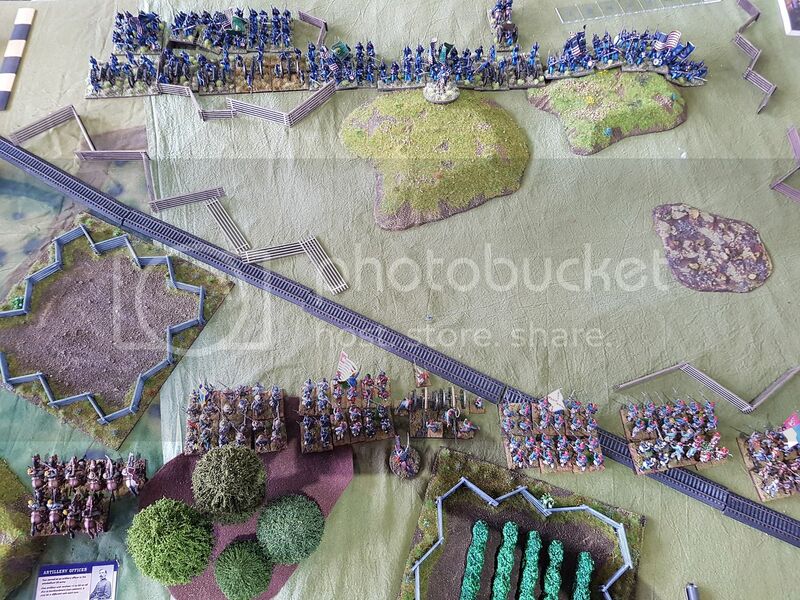 With the troops on my left trying to manuever arond the fields and avoid the artillery, my centre charged forward. 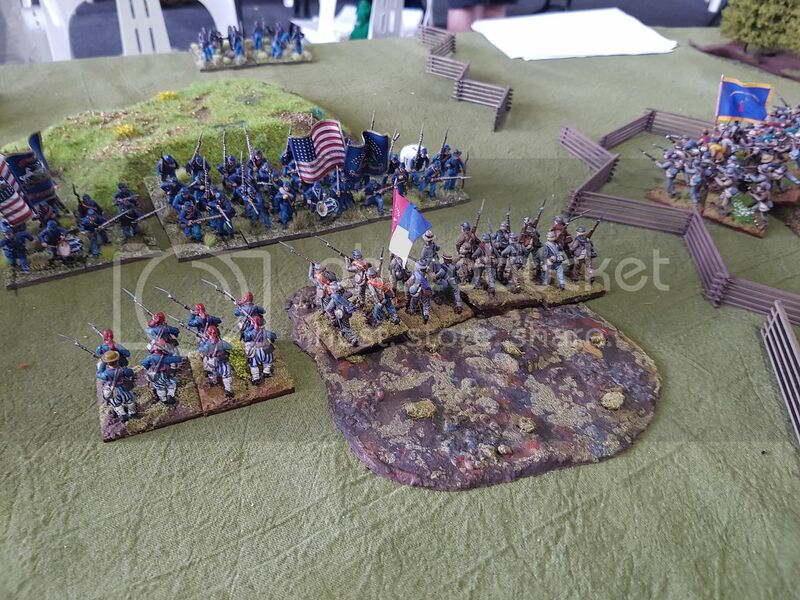 On the right one regiment began working around the flank as the rest of the right advance under the fire of the guns who eventually retreated. 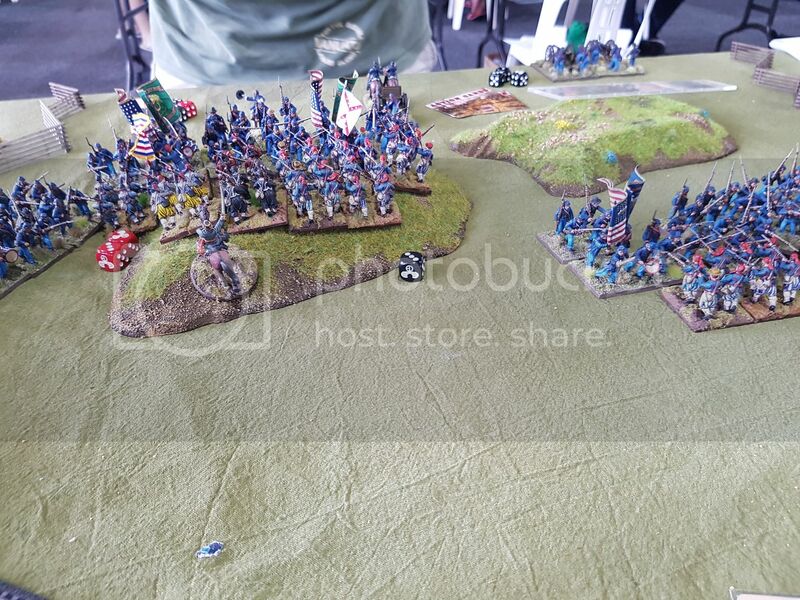 Dave manged to swing some troops out from behind his guns to flank my advance. With my self leading my troops we paused on the top of the hill. I was going to charge down but that is when Dave pulled out "Couldn't hit an Elephant..." and I rolled a 6. No cards in my hand, no turn. Back to Dave. Dave took the oppotunity and charged. 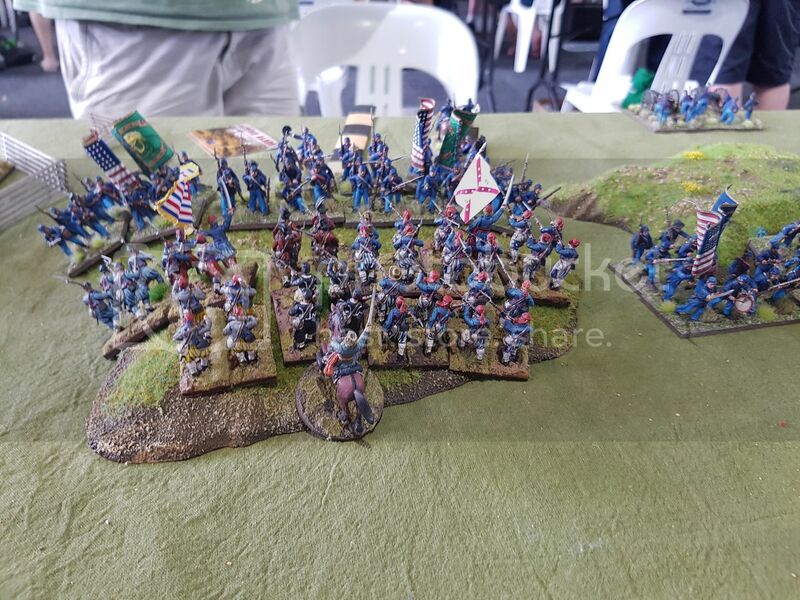 My left most unit was flanked whilst my right most just sat on the Union flank and watched them charge off to beat up their comrades. The brutal fighting saw one unit eleminated and the rest driven off. This with losses to artillery brought my army to break point. 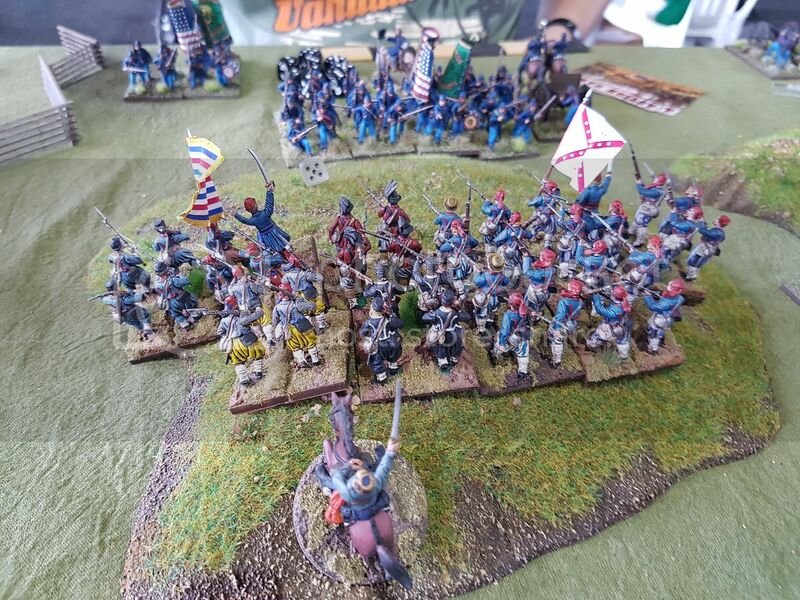 In the post battle pahse I was able to bring my army back up to strength with recruits and new units, including a lot of artillery reinforcements at last. I still had no heroes or sharpshooters in any units. My rolls were abysmal. Thanks for the pictures very nice! I hate that card if only because on the one time I played it on someonelse they rolled a 1 and I always lost all my cards! Ok so I did use "Pinkerton Intelligence" and "Local Assistance", allowing me to remove a few cards from my opponents hand, as much as possible. The one card it seems the experienced players didn't like was "Poor Surveying", which when being charged you may place a piece of rocky ground or swamp anywhere that is open. To me it would make more sense if it had to go in front of the charging unit. Anyway you couldn't use that effect but it stayed in the deck for the morale value (used to reduce casualties). I think all of us wanted all the shiny toys so nobody stopped us except the dice. 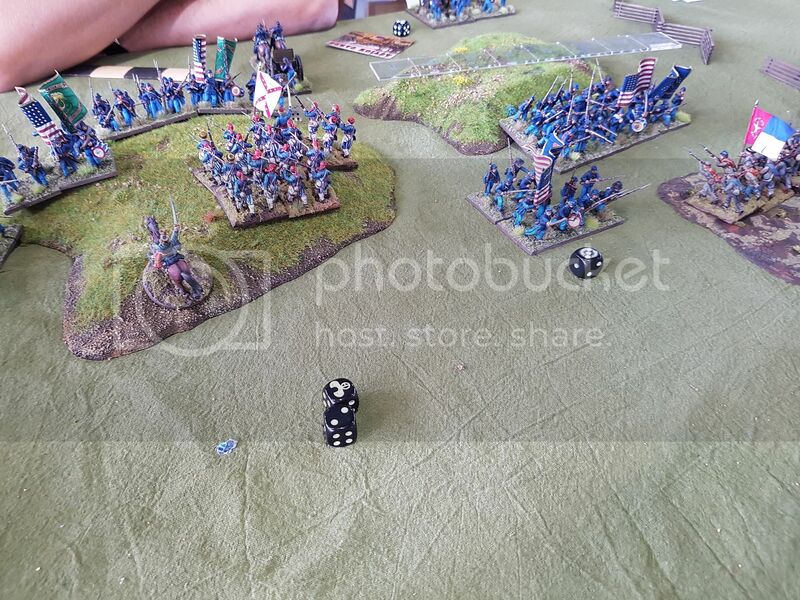 I only rolled up one hero, in the last game, just before his unit was shattered by the Yankee steamroller. I think the card needed to specify that it had to be in front of the charging unit if there was space for it to fit. 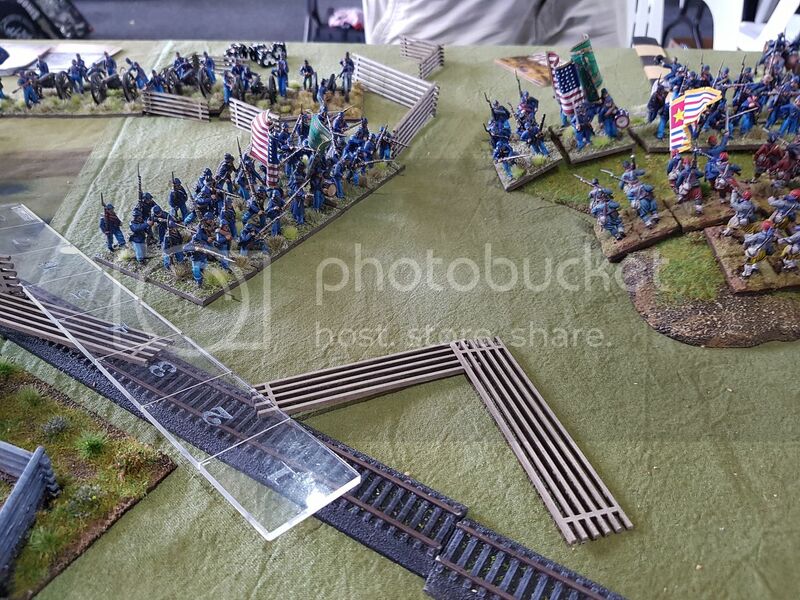 I do think it needs to be there to truly capture the feel of ACW battles which is something I now think Longstreet does very well.